The Trinidad and Tobago international, 28, has penned a three-and-a-half deal at the Stadium of Light club. "We are absolutely delighted to have captured such a sought-after, top player," said manager Roy Keane. "A lot of clubs have been interested in Carlos, so it's great that he will be here at Sunderland to play his plart in getting us back to the Premiership." Edwards enjoyed an impressive World Cup campaign last summer, playing in all three games against Sweden, England and Paraguay. He joined Luton from Wrexham on a free in May 2005 and went on to make 74 appearances, scoring eight times. 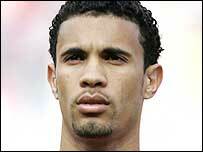 Edwards began his career with Trinidad side Defence Force before joining Wrexham in June 2000 for £125,000.